Free Books on Tape - Who is Eligible and How Do I get Started? My father-in-law who has wet macular degeneration has been using the Free Books on Tape program for several years. During these cold winter months in Wisconsin it has been a great source of enjoyment as well as education for him. Many of our conversations include discussions on his most recent "read" as he provides us with details of the American Revolutionary War or the farming practices of Indonesia. He can dive into Civil War history or escape to Thailand all without ever having to leave the house. 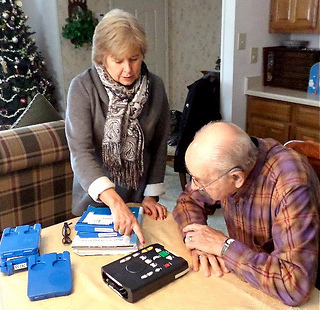 The National Library Service for the Blind and Physically Handicapped Talking Books program is available to U.S. residents and to citizens who live abroad. The books on tape and the device are sent at no charge through cooperating local libraries through out the United States.